Upper Hazard Lake is located in the Payette National Forest, north of McCall. The trailhead is at the Hazard Lake campground, just over 25 miles from McCall. It’s a short and gradual two-mile hike, which makes it a popular excursion for day hikers. 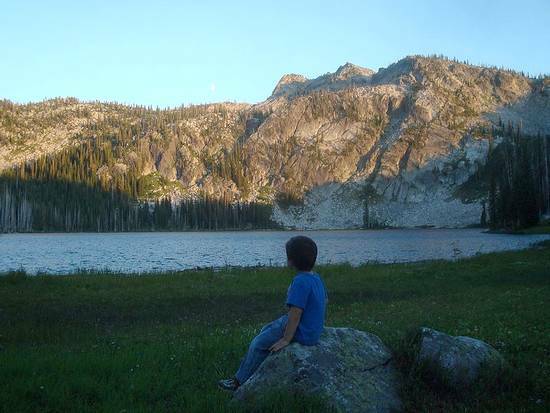 It also makes for an easy overnight backpacking destination for young families. I needed to make up for a rough outing earlier this year with my sons, and chose Upper Hazard Lake since it looked a fun and easy backpacking trip. The drive from Boise took us a little over three hours, and we hit the trail at around 4:30. The boys were anxious to get going, and went racing up the trail, both of them wanting to lead the way as usual. Soon enough, we settled into a more courteous “is it my turn to lead?” mode. A forest fire had consumed the area back in 1994, so there wasn’t much shade. But the mix of silvery snags and lush underbrush made for some very pretty scenery. The lower part of the trail skirts the edges of some beautiful meadows, then gets only slightly steeper before reaching the lake in about two miles. Based on our pace, I think its just about time for me to start sharing some of the 50lb pack weight with my energetic sons. After our usual dinner of quesedillas and ketchup, it was time for some exploring. So we headed up the trail, and the boys ended up leading the way to Hard Creek Lake. Along the way, we stopped a couple times to scramble up and over nearby granite boulders. We sat by the shore checking out a burned hollow log that fascinated them, and watching the fish jumping in the lake. Soon enough, it was time to head back to our campsite. Once back at Lower Hazard, we wandered down to the northern end of the lake to check out the sunset, complete with orange light on Bruin Mountain in the background. The moon was also rising up over the shoulder of the peak, making for a neat scene. Then it was time to hit the hay. The next morning we pumped water (always a highlight), watched the fish jump, and had some oatmeal. Then the boys played in the dirt while I broke camp. The hike back down was nice, and we stopped occasionally to listen to the wind whistling through the burned snags. My sons also did a great job of putting together a colorful bouquet of wildflowers along the way to take back to Mommy. We were then rewarded with PB&J’s when we got back to the car. Open meadow, not far from the trailhead. Still stream and silvery snags from the 1994 fire. The trail winds through the snags. Playing on a slab between the lakes. Watching the sunset and moonrise. The moon rising above Bruin Peak. A quick jog on the trail to get warmed up.